Situated on the Monongahela River in the north-central part of the state, Morgantown is the largest city and home to West Virginia University. Originally called Morgan’s Town by one of its earliest settlers, the city has abundant opportunities for adventure, culture, relaxation, and fun. Visitors can blaze a trail, discover history, attend a local sporting event, or visit a museum. Family and kid-friendly, Morgantown is a fun place and these 10 activities will help you enjoy it to its fullest. Every Saturday Morgantown hosts a farmers market in the downtown area from 8:30 a.m. until noon. The weekly event has become increasingly popular year-round, and supports local growers and other community vendors by giving them the opportunity and space to sell fresh produce and other items. The more than 40 vendors work to make fresh, healthy food available to everyone, especially economically disadvantaged families by the stands, nutrition counseling, and events that promote gardening and cooking. Prices are very reasonable. Originally surveyed by George Washington in the late 1700s, the original intention for the lake was for it to be used for a hydroelectric dam, but World War II broke out and plans were temporarily stopped. The impact of coalmining in the area greatly damaged the lake and most of the wildlife was killed from the resulting pollution. A local environmental organization along with First Energy worked to clean up the area and now it boasts a scenic trail where visitors can see local flora and fauna. There’s a boat launch, fishing dock, children’s playground, and picnic tables nearby, too. Free and open daily, the West Virginia Botanic Garden in Morgantown is on property that was once an 82-acre reservoir. There are five trails that meander through the gardens, each about a mile long and there’s a welcome center where visitors can learn more about the mission of WVBG and about some of the activities available like the summer nature camp, school programs, and monthly family walks. The facility can also be rented for special events and groups, and leashed dogs are permitted. If you enjoy birdwatching, there are at least a dozen species that can be seen as you walk the shaded trails. Long before West Virginia was inhabited by natives or settled by the Europeans, dinosaurs roamed the area. Visitors to the Museum of Geology and Natural History in Morgantown can see replicas and geologic specimens that are part of the state’s history and learn more about how the mountains, rivers, and valleys were formed. The museum is small, but the staff is friendly and passionate about sharing their knowledge of wild wonderful West Virginia. Come celebrate the Festival of Food and Wine in Morgantown, West Virginia, for a culinary experience you won’t soon forget. Held at the Lakeview Golf Resort & Spa, visitors can select a day or weekend packages and each includes meals. There are wine and beer tastings, food sampling and cooking demonstrations, a special marketplace featuring artisan foods and wine, and the Iron Chef Competition. If you love gourmet coffee, specialty teas, and delicious hot chocolate, you’ll want to stop by the Blue Moose Café the next time you’re in Morgantown, West Virginia. Known as a cultural mecca for local events like live music performed by local and renowned musicians, literary groups, and art shows every month makes this a very popular spot. Free Wi-Fi makes this a great place to sit back and relax, too. 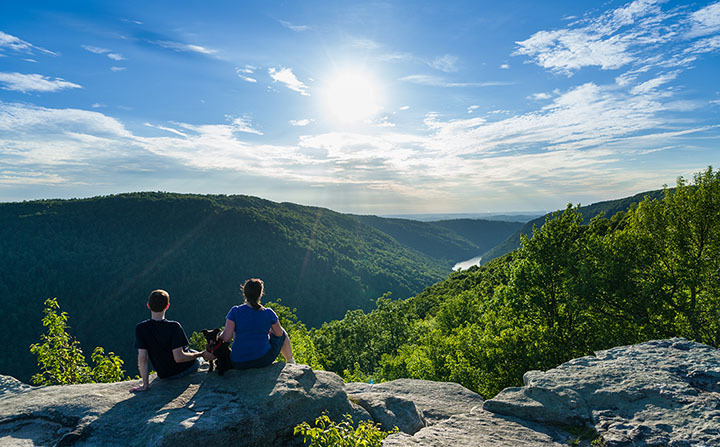 Offering almost 50 miles of trails for every skill level over a 12,747-acre state forest, Coopers Rock near Morgantown, West Virginia, also has family fun at historic sites, amazing photography opportunities, and provides the ideal getaway for you and your special someone. For those who are all about outdoor fun, you hike or bike the trails, raft on the Cheat River, hunt for one of the 14 geocache treasures hidden in the park, or learn about WV history at the Morgantown Glass Museum. Looking for something fun to do with the whole family? Travel to Hovatter’s Wildlife Zoo not far from Morgantown, West Virginia and introduce your children to animals from all over the world. Chimpanzees, bears, tigers, lemurs, and other furry creatures call the zoo home, and you can feed over half the animals that live there. Open from April to October and at limited times in November, this is a great place to share with your family. For more than 30 years, the WVU Planetarium has been providing Morgantown and the general area with out of this world fun and information. Thousands of people attend the sky shows and presentations that are fun and educational. Visitors get a special treat at the end of the presentation when they get to look through the 14-inch Celestron telescope and see constellations, stars, and planets above. No visit to Morgantown, West Virginia, would be complete without stopping by Mario’s Fishbowl, home of the large goblet of beer. What started as a family-owned confectionary with a lunch counter in the 1950s has become one of the most iconic eateries in the area and appropriately named for the fishbowl-shaped glass container in which the ice-cold beer was served. Also known for fantastic wings, sandwiches, and hand-cut fries and onion rings, Mario’s Fishbowl is a tradition worth sharing. Open since 1924, the historic Metropolitan Theatre has consistently hosted top-notch performers since its earliest days. Described as “West Virginia’s most beautiful playhouse,” it’s impossible to miss this neoclassical revival-style structure as you pass it on the street. Catch dance and theater performances as well as musical acts (national and regional) year-round at the Metropolitan Theatre.